Hands free dog leash or Jaeger lead. Built with climbing rope. Used over the shoulder. Custom options available. More people are discovering that a Handsfree Dog Leash when used correctly can be the perfect leash for hiking, camping and jogging with your big dog. 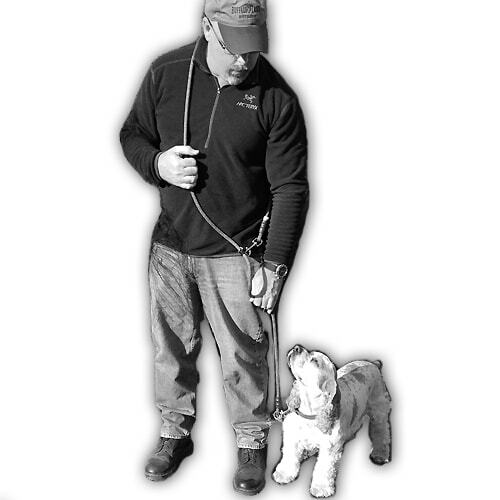 This Handsfree Dog Leash is modeled after the German Jaeger leads sometimes used with hunting dogs. Although its not completely “handsfree”, it’s over-the-shoulder design does give more freedom to use your hands for other things and still have your dog secure on the leash. The use of mountain climbing rope improves on the original Jaeger leash design and comes in different colors and options. Our Handsfree Dog Leash is designed to go over the shoulder.Some claim it works fine around the waist for jogging with their dogs. It comes standard with two 316 stainless steel swivel clips, one at each end with an adjustable welded stainless steel ring on the main lead. An additional ring at the dogs end allows flexibility in how the lead is used. The overall length of the leash is eight feet. The Jaeger Leash can be customized with locking carabiners and CE rated 360 degree nanoSwivel. This setup is perfect for hiking and camping with your big dog. Please check out the reviews and detailed specs and option for the Jaeger or Handsfree Dog Leash, just click the link.